Gov. Bullock was joined by tribal leaders from across Montana as he signed an executive order creating a state office of American Indian Health. The lifespan of Montana’s Native Americans is twenty years shorter, on average, than others in the state. 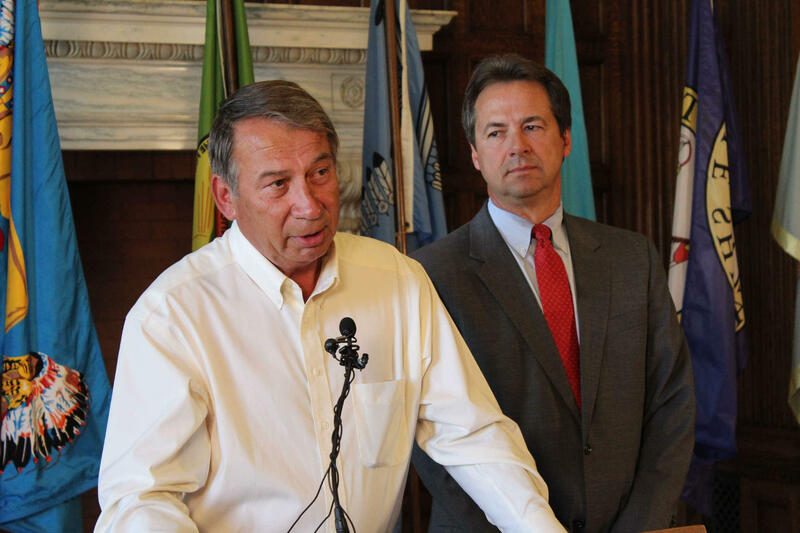 Montana Governor Steve Bullock is launching an effort to close that gap by finding and fixing the shortcomings of the health care system for the state’s Indian population. "Too many families are losing entire generations. And with them, we lose essential wisdom and expertise and experience," Gov. Bullock said. Bullock Tuesday capped a two-day summit meeting with leaders of Montana’s eight tribal nations by signing an executive order creating a new Office of American Indian Health, tasked with bringing state, tribal, and federal officials together to ensure that the state’s native and non-native residents have the same access to essential health services. At his side for the ceremony was Kevin Howlett, Health director for the Confederated Kootenai and Salish Tribes. Howlett says this is just the beginning of a long process. "What we want to do is set the table. We want to bring the parties to the table and we want to have a discussion about what the problems are and what some probable solutions might be." Kevin Howlett, CSKT Health Director speaks during Tuesday's news conference as Gov. Bullock looks on. Montana tribal leaders last year pressed officials to overhaul the federal health care system for Native Americans, citing a shortage of trained medical personnel and misdiagnosed illnesses among problems they've experienced. Senator Steve Daines says average prices for health insurance policies for two of Montana's largest health insurance companies are going up by more than 20%. But the companies' filings with regulators say otherwise. In a speech on the Senate floor last week, Montana Senator Steve Daines lambasted President Obama for what he says are huge increases in the price of health insurance in Montana, but he didn't get the facts exactly right. Monday in Helena, an appointed committee began preparations to close the Montana Developmental Center (MDC) and put its clients into community-based treatment. The panel is also being asked to deal with sinking employee morale.